Unlocking the vehicle. Press the button. Press and hold for convenience opening. Locking the vehicle. Press the button. Press and hold for convenience closing. 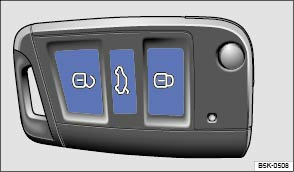 In vehicles with a SAFELOCK mechanism, press the button once to lock the vehicle using the SAFELOCK mechanism. Press the button twice to lock the vehicle without the SAFELOCK mechanism. Unlocking the tailgate. Press the button . Please note: depending on the central locking function that has been set in the infotainment system, all of the doors and the tailgate may only be unlocked when the button is pressed twice . The vehicle key will lock or unlock the vehicle only when the battery has enough power and the key is located within a few metres of the vehicle. 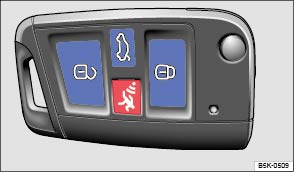 When the vehicle is locked, all turn signals will flash once as confirmation. When the vehicle is unlocked, all turn signals will flash twice as confirmation. If the turn signals do not flash as confirmation, at least one of the doors or the tailgate is not closed. The vehicle cannot be locked using the vehicle key if the driver door is still open. The vehicle will lock again automatically within a few seconds of being unlocked if you do not open one of the doors or the tailgate. This function prevents the vehicle from remaining unlocked if the unlocking button is pressed by mistake. See electric windows – functions . See function of the electric panorama sliding/tilting roof .